Mandy Coalter draws on her extensive HR experience in the schools sector and beyond to support you to build a great place to work where everyone can excel in the interests of the children. She provides practical tips and support that will help to improve staff retention, performance and engagement, while tackling topics such as addressing teacher workload, what really motivates and retains staff and the crucial role that leaders play in ensuring great people management in schools. Insightful, captivating and authentic, Mandy suggests fresh and practical new ideas and opportunities to strengthen your school and teachers, better equipping them to support their pupils. A graduate in Law, a Fellow of the CIPD and a trained Executive Coach (ILM7), Mandy joined United Learning in 2012 where she developed a 5 Year People Strategy. The United Learning HR team won the Chartered Institute of Personnel and Development ‘HR Team of the Year’ in 2016. HR Magazine listed Mandy in the top 40 ‘HR Most Influential’ in 2017 and she was shortlisted for the HR Excellence Awards ‘HR Director of the Year’ 2018. Mandy has previously worked in senior HR roles in local government, the NHS, the voluntary sector and with schools. Since 2012 she has been Director of People at United Learning responsible for HR, Talent Management, Leadership Development, Marketing and Communications. United Learning is one of the largest schools groups in the UK, running 60 schools across State and Independent sectors. Mandy has built the group reputation as an employer, taking forward key priorities such as developing leaders, talent management, employee engagement, wellbeing, recruitment, pay and performance management. Mandy is also a very experienced Board Director and advisor on aspects of corporate governance. The United Learning HR team won the Chartered Institute of Personnel and Development ‘HR Team of the Year’ in 2016. HR Magazine listed Mandy in the top 40 ‘HR Most Influential’ in 2017 and she was shortlisted for the HR Excellence Awards ‘HR Director of the Year’ 2018. Mandy is a working Mum and is proud to be able to work flexibly to accommodate life and career. She is a passionate advocate of the benefits of flexible working for schools, business and employees. When I was a headteacher, it often felt like the local authority HR function was only really there to manage basic administrative processes and keep me out of trouble when I was dealing with tricky ‘people issues’. Looking back, I had really missed the point. In this inspiring book, Mandy Coulter draws on a wealth of experience and knowledge from both within and beyond education to challenge heads and school leaders to really think differently about managing the talent of all their staff. 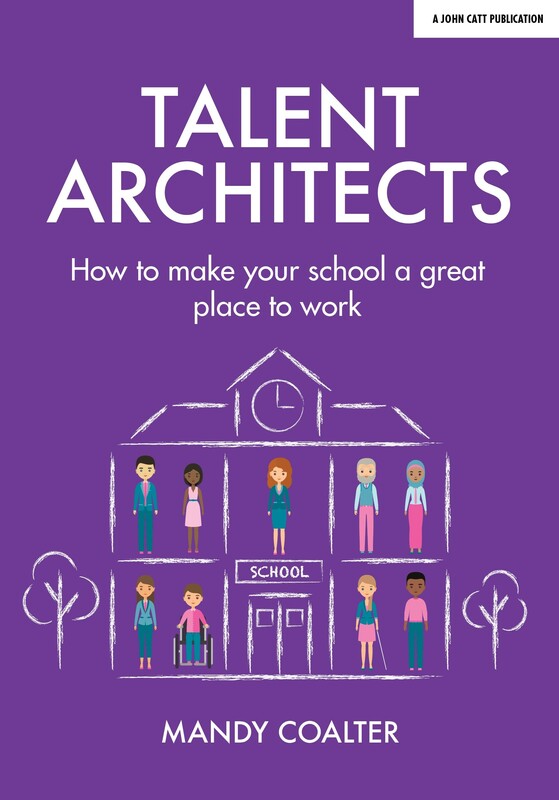 Backed by strong evidence and packed to the brim with practical advice and suggestions, it offers a compelling vision for how schools can take a no-nonsense look at staff recruitment, development, retention and well-being. This timely book is a must-read for anyone who wants to know more about how to ensure pupils are taught and supported by motivated and engaged teachers, leaders and support staff at all levels within our schools. Having benefited as a Head from working alongside Mandy Coalter for many years, I’m delighted she has distilled her invaluable insights and experiences of how to create great places to work into four simple pillars of practice. Every school and college leader who truly values their people should consider these with care and enact them with unwavering optimism as soon as possible. Essential reading for any leader who recognises the imperative of building a school culture that values people. A no-nonsense guide to workforce planning, flexible staffing, unconscious bias, employer branding and recruitment. Highly recommended.